Ne-Yo’s debut album, In My Own Words, was released in early 2006, through Def Jam Recordings, and debuted at number one on Billboard 200, selling over 301,000 copies in the first week and certified platinum. During the same week, Ne-Yo’s second single “So Sick” (produced by Stargate) reached number one on the Billboard Hot 100 chart. Ne-Yo is as famous for his songwriting as for his singing, writing such songs as Rihanna’s top ten hit “Unfaithful”, Mario’s “Let Me Love You”, Mario Vazquez’s “Gallery”, Paula DeAnda’s “Walk Away (Remember Me)”, and Beyoncé’s Billboard Hot 100 ten-week number-one hit “Irreplaceable”. His second album, Because of You, was released May 1, 2007. The first single from the platinum-selling album was “Because of You”. He has also said that he has written songs for Whitney Houston, Celine Dion, Britney Spears, Corbin Bleu, and Enrique Iglesias for their upcoming albums. Smith also has stated that he will write songs for Craig David, Usher, Chris Brown, Jennifer Hudson, Leona Lewis, and he recently confirmed that he has been contacted by producer will.i.am to work on Michael Jackson’s upcoming album. He appeared in the song “Deewangi Deewangi” in the Hindi movie Om Shanti Om. The Lazy Love Songfacts reports that Ne-Yo’s fifth studio album was originally titled ‘The Cracks in Mr. Perfect’ before Ne-Yo changed it to R.E.D, which stands for “Realising Every Dream”. 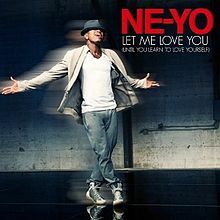 “Let Me Love You (Until You Learn to Love Yourself)” is song performed by American singer-songwriter Ne-Yo, taken from his upcoming fifth studio album, R.E.D. (2012). Released on July 10, 2012 by Motown Records, the song serves as the mainstream lead single from the album following the release of an R&B-tinged lead single, “Lazy Love”. “Let Me Love You” combines elements of synthpop and Europop with a celebratory chorus co-written with indie-pop songwriter Sia Furler and production courtesy of Ne-Yo’s frequent Norwegian collaborators StarGate and British producers Mark Hadfield and Mike Di Scala. A music video directed by Christopher Simms sees Ne-Yo “channeling” the late Michael Jackson in his dance moves, as well as showing off a toned six pack and physique.